Agra was a breath of fresh air after so many days in Varanasi. We only spent one day here and aren’t sure if that was just right or too short. Either way, Team MussMart saw our first Wonder of the World, both as individuals and as a couple. Our first stop was Agra Fort. We were blown away with the beauty and magnitude of the Fort. Construction on the fort started in the 11th century and was added to and altered until the 1600s. The fort is a mix of red sand stone and marble. The marble portions of the fort were really the most stunning. An added bonus is being able to see the Taj Mahal off in the distance. The next morning at sunrise, we walked to the Taj Mahal. Many people recommended we go at sunrise because of the way the sun reflects off this grandiose wonder. The other reason for going that early in the morning is that its not too busy and hectic. The pictures are the best we can offer you, which will never do the Taj justice. The building is completely symmetrical, except for the two tombs inside. It is as tall as it is wide and was built all for the love of a woman. 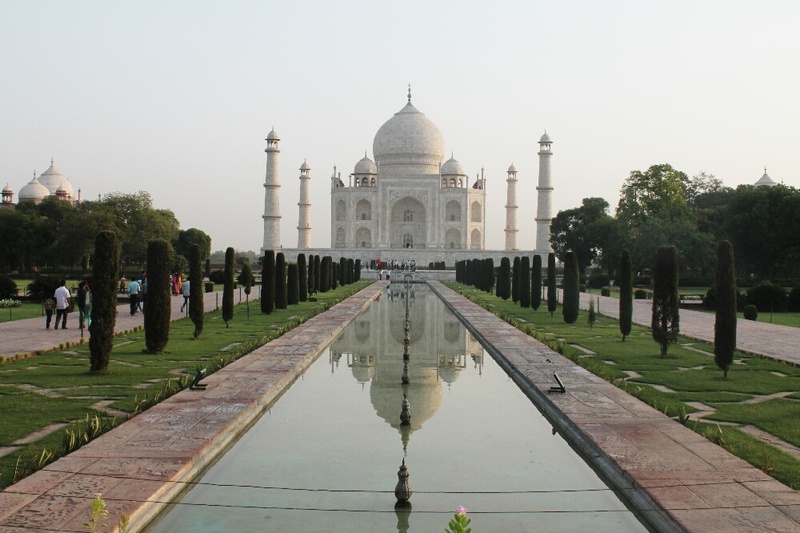 It was built for Mogul Emperor Shah Jahan’s favourite wife. Inside this monstrosity lies the two of them. Her tomb is directly in the middle, whilst his is to her left. The Taj Mahal truly is a wonder of the world. Stephen better start saving his pennies cause I am definitely expecting something equivalent one of these days. Posted on June 11, 2014 by themussmarter	This entry was posted in General MussMart News, India. Bookmark the permalink.